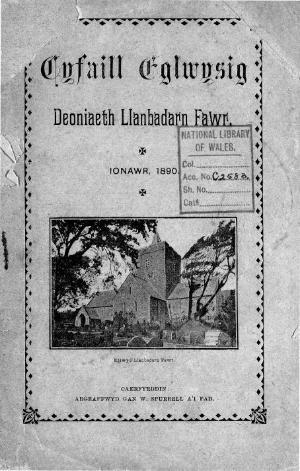 A monthly Welsh language religious periodical serving the Established Church in the Deanery of Llanbadarn Fawr. The periodical's main content was news from the parishes and churches of the deanery, with the Cyfaill Egwlysig included as an insert to the periodical. Amongst the periodical's editors were John Thomas Griffiths, Hywel Meredith Williams, Daniel Arthur Thomas and Daniel Morgan Davies. Associated titles: Cyfaill Eglwysig Deoniaeth Llanbadarn Fawr a Glynaeron (1894); Cyfaill Eglwysig Deoniaethau Llanbadarn Fawr ac Ultra Aeron (1913).